Nine months on the road is a long time. As I often say, if I was cooking up a baby it would be ready by now. But thankfully I’m not, I’m much closer to wanting a little puppy to live with us than another baby (my baby is almost 19 now), and we’re not done travelling yet. In reality we’ve not gone too far yet either. Dixie has driven us only 21,000 miles in total. It looks pretty impressive on our map of overnight stops though! 9 short but epic months! In the beginning, first living and travelling in Dixie, we were shy. Shy to speak to strangers, shy about who we are and what we are doing, just shy in general. In the evening we would stealth park, disguise Dixie as a normal commercial van by blocking out all the light and quietly hide inside, a little afraid of speaking to strangers, a little wary of peoples motives and definitely concerned about perceptions, knowing certain people will jump to all kinds of conclusions when they hear we are Irish and we live in a 21 year old white van. 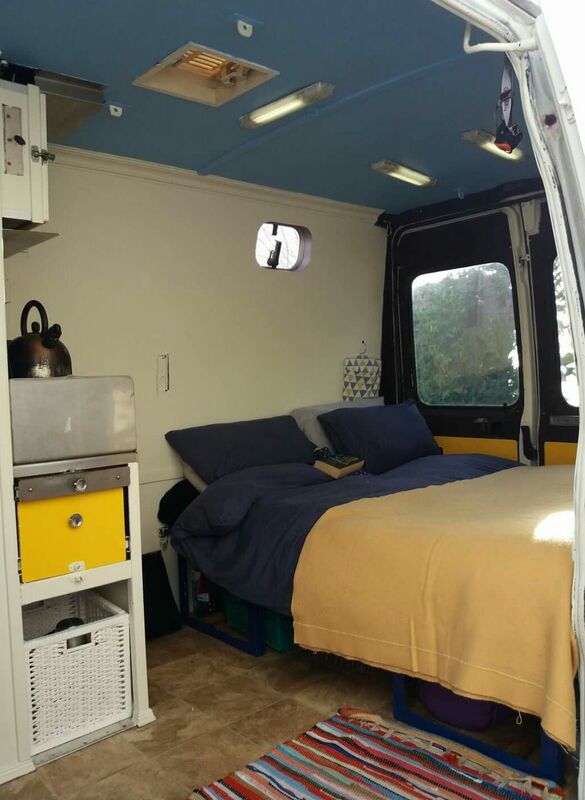 Being that little bit more open to meeting and interacting with new people has been part of the huge learning curve of vanlife and has taken us both well out of our comfort zones. Neither of us would consider ourselves remotely ‘outgoing’ people so although a long time coming, this change has been really interesting and these random encounters have always proved fun and informative. Vanners and motorhomers are a remarkably friendly and helpful bunch and as for strangers (and dogs) we see on the street? They really are just friends we haven’t met and petted yet. So glad we stopped to talk to this wonderful lady who makes delicious mustard! Casual conversations with strangers always come back to our travels as locals will ask where we have visited nearby and other vanners will eagerly share their experiences with us. One question we hear time and again is also one almost impossible for us to answer. In all of our 9 months of travels, where is the worst place we have ever been? What an odd question when you think of it, and the answer is far more complicated than simply pointing to a place on a map. The Worst Place We’ve Ever Been, we both agree, is in our own heads. Vans have wheels for a reason. If we drove into an area that we didn’t feel comfortable in, or somewhere we considered ‘not quite right’, perhaps the streets were a little shady or the parkup we had chosen was not what it appeared to be online, we would simply keep driving. A better place, a safer or more peaceful spot or even just a better lit street is usually just around the corner. Not so easy to drive away from any issues within yourself. Truthfully, we could be in Bermuda, in Barra, in Bahrain or in Bangladesh and still feel bad. We could be safe, secure and spoiled for beautiful scenery and still be sad. So much in life depends on our mental health, our attitude and our frame of mind and living in a van is no different to living in a house in that regard. Dogs always seem happy and I suppose it is in part due to the attention, love and daily care they receive. Who wouldn’t want a human friend to look after you, feed you and love you unconditionally, even after you poop on the floor? They seem to have the right attitude, happy, silly, friendly and a dogs ‘glass’ is always full, sometimes overflowing. Dogs can be as weird as they want and humans don’t ever mind. I’m rather jealous to be honest, I think I’d make a good dog. So peaceful outside, but what about within? Now, as some of you know and follow, we update our Facebook page every evening with tales of how we spent our day. It’s a fun way to keep track of our travels, sort of like a diary for us to reference and we add plenty of photographs of the sights, happenings inside Dixie or whatever occurs of any interest to us along the way. We love the interaction we have with our readers and these posts always have a positive slant. Not everything always goes right in Dixie, for example, we are currently somewhat stranded as we got distracted by something shiny earlier and completely forgot to buy diesel, not realising everything is closed on a Sunday in this part of Scotland, in fact we had forgotten it was Sunday at all. Combine this with our rogue Sat Nav sending us to a ferry route we assumed was a bridge and we have managed to add about 15 hours onto our journey in the form of an unplanned overnighter by the gas station waiting for it to open, we could easily get annoyed at ourselves, angry, upset or frustrated by the delay. Or we could just laugh about it, put the kettle on and find a lovely spot nearby to watch the sunset. We will choose the second option everytime. Why? Because we both know depression. We have both been there, through lifes ‘ups and downs’, through bereavement, through relationship breakdowns, through hurt, self-hurt and for all kinds of other reasons too big to mention here. The writer Samuel Johnson famously called his depression his Black Dog and we have both had such loyal canine company through our lives, often navigating a dark lonely road and spending so much of our time attempting to just cope. Self medication is easier than facing any problem and, as we Irish people can so easily, we blended in for a period of time using (or really, abusing) alcohol as a way of ignoring things, hiding ourselves in lifes shadows and avoiding any perceived attempts to uncover our real issues. We realised how unfulfilled our lives felt, the daily grind of waking, working, sleeping and it just wasn’t working for either of us. We didn’t want to continue on the same path forever, although both our black dogs were well fed on this road with plenty of reasons to be unhappy from financial, health and emotional issues to a lack of any kind of direction or hopes for a brighter or different future. At age 36 I knew I could be chained to a desk for a further 30 years and that was a terrifying prospect for me, I wanted to feel free, to write, to live off-grid and immersed in nature, not next to the filing cabinets, the binders and all of the associated office politics. We knew we had to change our ways to salvage any kind of happiness and contentment from our lives and so we started to assess our options. Somethings come easy in life once your first decision is made and other things bring about their own sets of challenges, giving up alcohol and saving that money towards our van was difficult in so many ways, again, it was a lot more complex than I could possibly write here. At first we found a whole new raft of reasons to be unhappy as we both struggled to change what had literally been a habit of a lifetime, hours usually spent in bars were suddenly free time we had to over-think instead, and some so-called friends abandoned us as soon as we no longer fit their clearly defined usage as a drinking buddy or fellow barfly. All hard things to deal with at first but we found as time went by we learned how to cope. Then one day we realised we were not just coping, we were thriving, and what was even better, we were taking actual steps to make our shared dream a reality. Money we had earned magically stayed in the bank as we adjusted our evening schedule to include long walks on the beach and hours of swimming in the sea, anything free we could spend our time doing we did. Re-evaluating our wants versus our needs was eye-opening. Nobody really wants to spend their hard earned money foolishly or pay top dollar for a horrible hangover, nobody really wants the headache involved. We needed to get more than that out of our lives. One day early on in our vanlife I asked William if we could get a dog. Besides the logistical nightmare and severe lack of space available inside the van for another body, our ability to stealth park and our freedom to travel between countries would be hugely impacted. Of course it is not so sensible when we are trying to live so cheaply to add to the equation another mouth to feed. William went to the shop one day and came back with Jim instead, our draught excluder dog, and he lives quietly and contentedly on the floor beside the sliding door, sometimes in winter shoved deep into the doorwell to prevent the cold and wind from creeping in. Jim is cute, he is silent and he is cheap to keep. We can run from our problems, trust me, I have ample experience at that. But we can never hide from ourselves. Making the decision to eliminate alcohol from our lives was easy but in practise it was a huge leap and one we took on in ernest, old habits of course being the hardest to break. Much like attitudes, habits are mired in comfortable reliability (just as I am rolling another cigarette as I write, that is another blog for another day) and the massive change in our lives needs to be acknowledged as such. We both have grown so much in the past short 18 months, taking alcohol out of the equation at least helps us to see, to not place blame where it does not belong, to be true to ourselves and to learn who we are and what that really means. Depression doesn’t go away, that black dog is a stubborn one and loyal to a fault. Sometimes one dog or the other starts acting up and the van becomes crowded quickly, with growling, snarling and barking at shadows and whichever pup it is this time it needs to be looked after, comforted and nurtured back to normality. Sometimes they fight amongst themselves and William and I take a back seat, waiting, watching, almost powerless though we both know what is happening it takes a little while to understand and we’re still learning how to recognise the signs and thus prepare for the inevitable pattern which will follow. Coping with depression is a skill, and just like these feelings develop slowly the solutions can be just as slow to arrive at, no amount of driving can take us from that place. The darkest place, the worst place we have ever been? We could put the pedal to the metal, drive and drive and drive forever and still end up right there. I asked William again before I published this post, can we get a dog? No, he said, we already have two. We are still learning how to train them, they are still learning to get along nicely with each other and that is enough for us right now. Previous postThe Unconventional Oven: Fruity Chocolate Vancake in a Tin Can! Thanks Joanne 😊 everything is great. We are learning, always learning! Alcohol and high emotions do not mix!! And as for the dog, we will continue to feed our own only goid thoughts and play woth the real ones we meet along the way! Thank you Anne ❤ I feel a lot lighter having spoken a bit about the drink, there is always a lot of pressure on a traveller when they are welcomed into a place to share a drink and it can get awkward quickly, we are learning how to speak to people I suppose! Wow, this was beautiful! Thank you for sharing such a vulnerable post with the world. I relate to so much of this including the daily grind of working, drinking, rinse and repeat. One of the reasons I knew van life would be such an amazing experience. It truly forces you to take a look at what is going on inside and deal with the issues that you’ve been avoiding.